Last edited by Ace2Ace on Jun Sun 10, 2018 12:08 pm, edited 15 times in total. Last edited by Ace2Ace on Jun Sun 10, 2018 12:06 pm, edited 2 times in total. Last edited by Ace2Ace on Jun Sun 10, 2018 12:05 pm, edited 2 times in total. Last edited by Ace2Ace on Jun Sun 10, 2018 12:04 pm, edited 2 times in total. Last edited by Ace2Ace on Jun Sun 10, 2018 5:48 pm, edited 5 times in total. Last edited by Ace2Ace on Jun Sun 10, 2018 12:17 pm, edited 1 time in total. Boring. Not quite Sanchez Vicario boring but still dullsville. Last edited by Grossefavourite on Jun Sun 10, 2018 3:22 pm, edited 1 time in total. Just watched Halep vs Muguruza. Couldn't watch it LIVE.#ed_op#br#ed_cl#That's the Halep I discovered when she was still ranked outside the top-100: aggressive.#ed_op#br#ed_cl#Nothing boring about that match. Muguruza was attacking. And Halep was even more aggressive. She had Muguruza under pressure the whole match, striking every ball. #ed_op#br#ed_cl#No waiting for errors; no sleeping 100 miles behind the baseline. Halep was hitting beautiful shots whether on the run or behind the balls. That's my girl.#ed_op#br#ed_cl#Muguruza was the one missing the shots in that contest of "who can hit on the run" and under pressure. Had Halep decided to play a passive game, she would have lost. Muguruza was not in kidding mode at all. She wanted to blow Halep away and was surprised about how aggressive Halep was in response. #ed_op#br#ed_cl##ed_op#br#ed_cl#Halep knew that the only way to beat Muguruza was to attack from the 1st ball to the last. And she did that. What a contest !!!!! Boring? Hell NO. That was Big Babe Power Tennis; top-10 tennis!! !#ed_op#br#ed_cl##ed_op#br#ed_cl#Against Taylor, the score really doesn't do Taylor justice. That was another match where both players were on the offense the whole match. Taylor was serving and returning well, playing aggressive tennis. She just made routine errors on the Big Points. She shot herself in the foot. That match was close despite the score. I like that both were going after each other. Didn't see the usual moon balls and weak serves from Taylor. She was good. Just needs to take care of the shots that look easy. I think she made the mistake of relaxing in these shots.. and missed. Can't do that. Got to stay focus on every ball, because every ball counts.#ed_op#br#ed_cl##ed_op#br#ed_cl#Halep is simply a better shot maker. She proved it against both Taylor and Muguruza.#ed_op#br#ed_cl#So far I have only seen 3 matches: Taylor, Muguruza and the Final. #ed_op#br#ed_cl#IMHO, The worst of the 3 is the Final because only Halep was trying to be aggressive. Sloane was just content staying in the point. Yeah she hit a couple of big shots but most of the time, she was just pushing and waiting for errors...(she was not playing Keys or Venus who can't stop spraying. Once Halep stopped gifting free points, Sloane was done) ... and her serves were weak for a powerful girl like her. Last edited by Ace2Ace on Jun Sun 10, 2018 5:31 pm, edited 9 times in total. 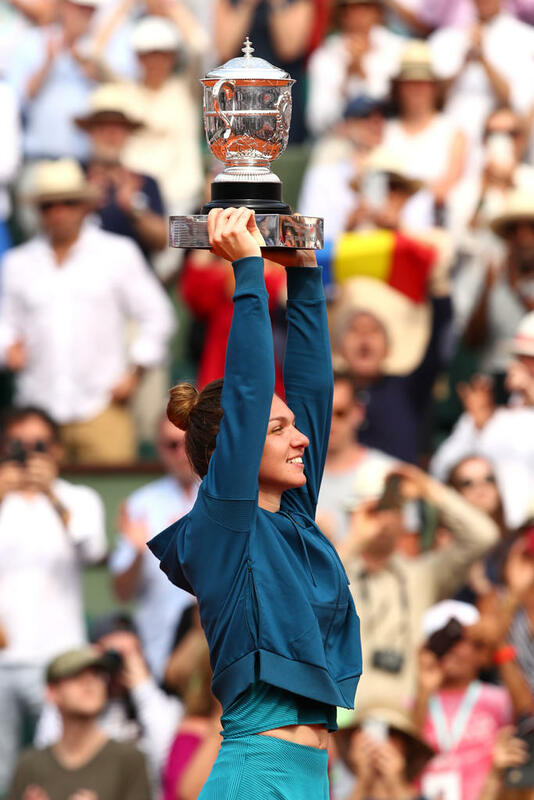 Halep winning RG was a question of time..
WTA now entering a great era: most top10 players won at least one slam so they can play more liberated. Woz and Halep winning a slam only makes the slams more exciting. Would be great to see Pliskova win Wimbledon and Svitolina the US Open. That would allow all top players to enters slams more relaxed. Last edited by Graveller on Jun Sun 10, 2018 4:27 pm, edited 2 times in total. Halep will influence those girls contemplating getting breast reduction surgery to improve their tennis.